Llwynog Coch - Red Fox - is the cunning shape-shifter creature of the Woodlands. She peers through the tangled woods, long red tail curling through the brackened ferns, poised, sniffing the autumn air as the resourceful squirrel gathers nuts and the wise hunter owl watches over the mice hidden in the undergrowth. Jen Delyth is the original creator of the Celtic Tree of Life, best selling Celtic Mandala Calendar and Keltic Designs by Jen Delyth textile and gift line. Her original Celtic Tree of Life design has become a well known symbol for the interconnection of all living things. 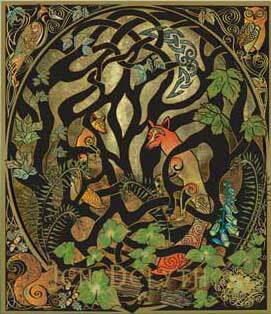 Celtic Fine Art Prints, Celtic Textiles, Gifts and Jewelry. Jen Delyth's original Celtic Tree of Life design has become a well known symbol for the interconnection of all living things. It represents Jen's artwork, and company Ninth Wave Publishing - Celtic Art Studio. Please check our licensing Page for more information.